Heat oven to 375°F. In medium skillet, crumble and cook turkey over medium-high heat 8 minutes, stirring occasionally. Layer in 11×7-inch (2-quart) baking dish. Layer with green beans and then white beans. In medium bowl, mix both cans of soup with 1/2 soup can of water (about 2/3 cup); pour over the white beans. Top with layer of potato nuggets. Bake 45 minutes or until thoroughly heated and bubbly, and potatoes are crisp. 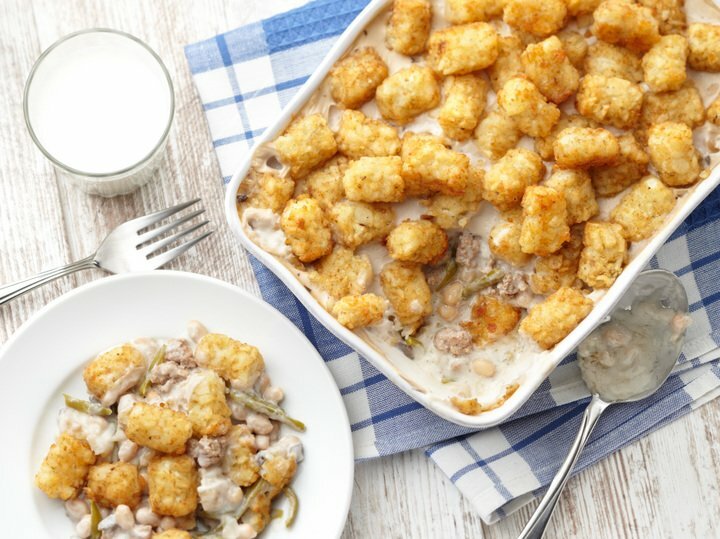 Tip: Keep the remaining potato nuggets in the freezer for a later casserole or use as a side dish for another meal.